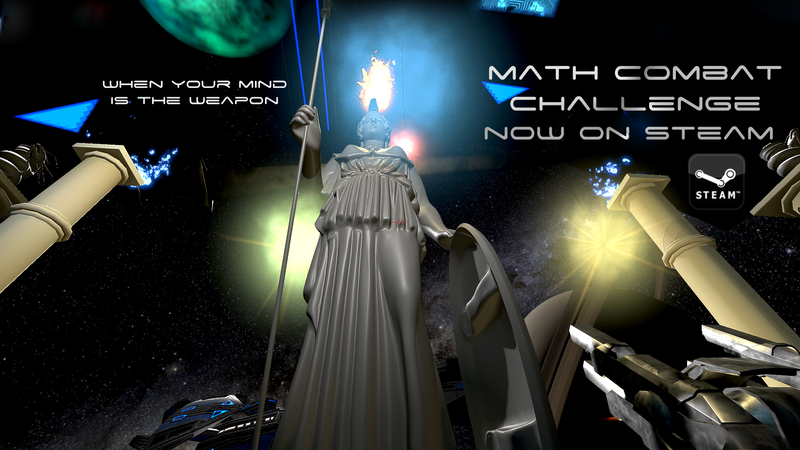 Changelog for Math Combat Challenge. • HDR when monitor available. • Shield regenerator. Can be deactivated with the config panel. • New columns of fire in Realm of Helheim. • Solved a problem that could generate the same values in a dynamic math operation. • Solved a problem that could avoid a message not being shown in space areas. • Change speed of some starships in space areas. • Added a new message when game ends in space with a victory. • Added a new circular opaque structure to be avoided in Realm of Helheim. • Some minor adjustments in Realm of Helheim. • Adjustments to keyboard in space arenas when there is no pad connected. • Solved a problem in Asteroid and Realm of Helheim arenas with the number of static panels generated. • Some minor adjustments to difficulty in Realm of Helheim arena. • Minor adjustments to the “Realm of Helheim” arena. • Fixed a problem that there was sometimes with the rumber number generator. • New free arena “Realm of Helheim”. Flying with the starship inside an infinite wormhole. Don’t try to leave the wormhole, that won’t be good for your health. This arena is a classical 3D arcade shooter in space. Remember Star Trek: the Motion Picture? When they fall in an infinite hole? Arm photon torpedoes! That’s the idea. • Only main lasers are operational. • Engine can’t be disconnect once it has been activated (F1 or left stick button). • Drone cubes and numbers explode when touched in space. • Shooting wrong numbers in space drains energy from shields. • Minimal speed is always faster than 1000. • Restore shields and weapons destroying enemy ships and drones, and also asteroids. • Numeric radar malfunction. You won’t be able to track numbers, just visual. • Don’t try to leave the wormhole, or go back. It won’t be good for your health. • Finish math operation because the wormhole ends, it’s indicated by a regressive countdown. • Take your medicine for your heart before flying this new free arena. Realm of Helheim, new free arena, now available. • Minor fixes in Math Garden for kids. • New free scenario available: Math Garden for kids. An enviroment specially designed for children, with no enemies, no weapons, and a water hose to choose the right numbers and solutions. • The cubes inside the forsaken base in Titan subtract dynamic panel errors. • Solved a stuttering problem in Asteroid arena that can happen when using the minigun against heavy ships. • Solved zero points in Asteroid Arena when player fails (does not affect Steam points, just the internal counter). 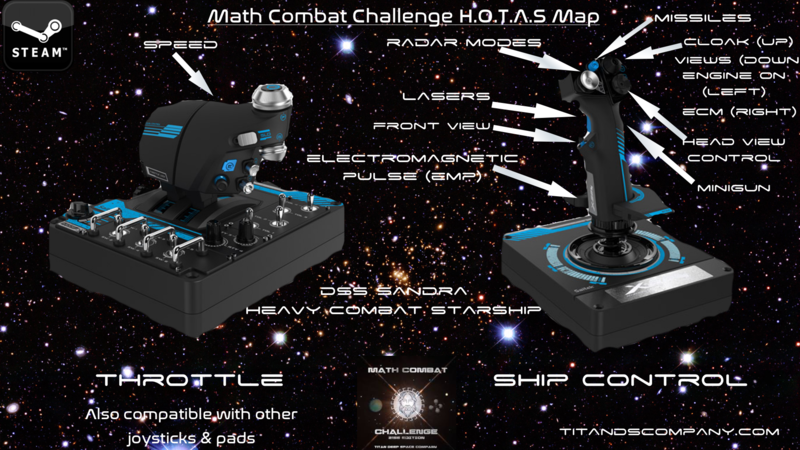 • Added compatibility with HOTAS Saitek X55/X56 and other HOTAS systems and joysticks. You can see the map here. • Some minor changes to surface arenas for medium level. • Some minor adjustments to the Titan Arena. • Some minor adjustments to Asteroid Arena. • Probability of reducing dynamic panel errors increased. • Minigun works like the M61 Vulcan, short bursts for every attack. • Solved a problem generating numbers in Titan Arena. • Modified some elements to avoid player being blocked in some areas. • Submarine and base drones are stronger and faster. • Reconfigured camera in Titan.